Professional International Movers - ﻿Professional packers movers Bangalore, Proffesional packers movers, Profesional packers movers Bangalore, Mumbai, Thane, Kolkata, Pune, Thane, Navi Mumbai, Mysore, Chennai, Indore, Jaipure, Chandigarh. Profesional movers in Bangalore, Indranagar, JP NAgar, HSR Layout, Jayanagar, MG Road, Ulsoor, Marthahalli, Whitefield, Indranagar, Kormangala. Warehousing, International packers movers, International Relocation Companies in Bangalore, Professional movers packers bangalore, worldwide packers movers services, car transportation services. Bangalore, Mumbai, Thane, Kolkata, Pune, Thane, Navi Mumbai, Mysore, Chennai, Indore, Jaipure, Chandigarh. Profesional movers in Bangalore, Indranagar, JP NAgar, HSR Layout, Jayanagar, MG Road, Ulsoor, Marthahalli, Whitefield, Indranagar, Kormangala. Warehousing, International packers movers, International Relocation Companies in Bangalore, Professional movers packers bangalore, worldwide packers movers services, car transportation services. YES, if you want a Internationally established moving company with 18 offices in India and partners in 1800 locations worldwide in 125 countries to provide seemless moving services, anytime & anywhere. A company which is part of major associations worldwide yet knows the local culture and customer demands. YES, if you want a Flexible company to facilitate you next move with Care and efficiency. Professional Packers & Movers is ready to take job of any size and respond efficiently and effectively to situation that may arise to provide you total mental peace. YES, if you want a Company which respects your trust and takes care of your belongings as much as you do, treats every item with care and attention it deserves. A Company who profits are not calculated from Accounts books but its Customers satisfactions and positive feedbacks. Professional Packers Movers Services are available in all major cities in India. We deliver to 254 cities and towns nationwide. Professional Packers Movers Services provide relocation services to USA, Australia, Europe, Middle East, Hongkong and Dubai. We promise service. And we keep our promises. Professional Worldwide packers & movers is owned and managed by people who understand moving from the customer's point of view. Professional International Movers takes a personal interest in your satisfaction; as our livelihood depends on it. You have just one person to deal with, one operator to serve you, and one place to call for answers to your questions. We make sure that we are there everytime you need us.. till the last box is delivered. Our reputation is based on your satisfaction. Professional Worldwide packers & movers have build their reputation by serving you its customers integrity, honesty, quality and customized solutions. Our investments in people, equipment and systems reflect our commitment to be your first and best choice for service. Ultimately, we strive to win your trust. We hope you find it reassuring to know Professional International packers & movers is nearby and ready to serve you when you need us. We provide effective colutions as per your needs..
We, at Professional International packers movers makes sure everything happens according to schedule, loading no earlier than one date and delivering no later than another. Our people are dedicated to making sure things go smoothly provide whatever support you may need. As our customer, you get online access to our information systems for checking the progress of your shipment. Dependibility and Trust has been our hallmark and that is what we strive for, with every move we do..
Professional Worldwide packers movers provides Innovative, Professional and Customized moving srvices for household & Personal goods, Car transportation, Office Equipments, Corporate Relocations, fragile goods, Computer systems and data storage devices, Machinery etc. 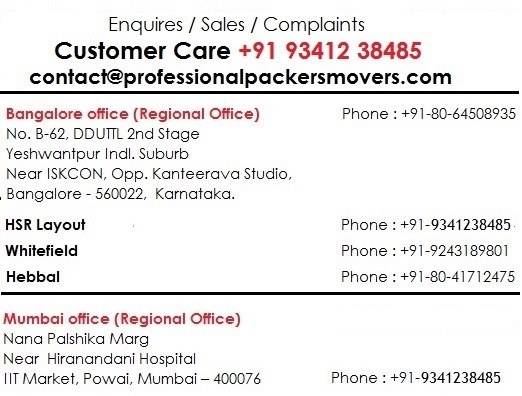 Professional Express Packers & Movers have offices in Delhi, Mumbai, Pune, Bangalore, NCR, Gurgaon, Noida, Faridabad, Ghaziabad, Kolkata, Bhubneshwar, Patna, Mysore, Thane, Indore, Ahmedabad, Chennai, Hyderabad, Lucknow, Chandigarh, Jaipur, Nagpur, Mangalore, Varanasi, Jamshedpur, Ranchi. We also provide Warehousing and Storage services for Long term and short term period. Professional packers movers in Bangalore. Pls mention the floor & availability of Lift, Share pincode. Pls mention the floor & availability of Lift﻿, share pincode. List of Household goods / Requirements.